The National Institute for Health and Care Excellence (NICE) has highlighted hospital discharge and increases in emergency hospital admissions as causes of significant anxiety, physical and psychological deterioration, and increased dependence. It also highlights the importance of multidisciplinary services that help people recover, regain independence and return home. Facilitating timely transfer of care from hospital, intermediate care and reablement services are all aimed at maximising people’s independence and reducing unnecessary hospital admissions. They also support people who have increasing difficulty with daily life, and whose ability to live independently is likely to improve with specific support and rehabilitation. This is differentiated from the provision of ongoing care and support, which provides assistance with daily tasks to reduce the risk of harm and sustain health and well-being. The National Audit of Intermediate Care divides such care into four categories: crisis response, home-based intermediate care, bed-based intermediate care and reablement. 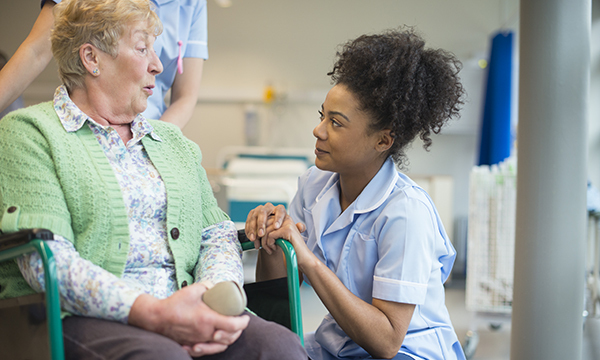 NICE'S new guidelines cover how to assess intermediate care needs and establish goals with the person concerned to help them overcome their problems. They urge staff to talk openly about risk, but in a positive way so as not to discourage people. The aim is to ensure that people can confidently accomplish what they want to do themselves and to ensure that risks are discussed and managed safely. or they are living at home and having increasing difficulty with daily life through illness or disability. The guidelines warn against excluding people from intermediate care based on whether they have particular conditions, such as dementia, or live in particular circumstances, such as prison, residential care or temporary accommodation. Intermediate care practitioners should develop goals in a collaborative way that optimises independence and well-being. They should also adopt a person-centred approach, taking into account cultural differences and preferences. At all stages of assessment and delivery it is important to ensure good communication between intermediate care practitioners and other agencies, as well as with people using the service and their families and carers. ‘Hospital admission often affects a person’s function and physical capability, which often leads to a reduction in independence. This is exacerbated in the elderly, who also take longer to recover function, if at all. ‘With this in mind, NICE is urging health and social care staff to support people to safely continue with everyday activities such as climbing stairs, dressing themselves or cooking after a period of illness, or if they have been struggling at home. ‘The guideline on intermediate care, including reablement, covers referral and assessment and how to deliver the service. Intermediate care is a multidisciplinary service that helps people to be as independent as possible, and nurses play a pivotal role.